The modern automobile has come a long way from Henry Ford’s Model T, which was primarily a steel box, painted inside and out, “any color you like – as long as it’s black!” A bit of brass trim around the headlights, natural wood spokes in the wheels, and leather seats, and you have the classic look! Today’s automobiles are a very different animal! In addition to the sleek lines and seemingly endless color combinations, the modern iteration is a complex combination of high-tech alloy’s, composites, plastics, and countless other natural and man-made materials. What’s more, the contemporary consumer is far more critical when it comes to fit and finish than were their parents and grandparents. All these factors combine to significantly complicate the task of applying the myriad finishes offered both on the exterior and in the interior of the modern automobile! Though Henry Ford was very concerned with the ruggedness and reliability of his Model T, it is certainly no match for today’s offerings. Safety and fuel economy were certainly secondary concerns in those early designs. Now, safety requirements are huge. “Crumple zones”, comprised of a combination of high-strength and malleable steels make up the body and frame to enable it to pass demanding crash tests. Also, on the tip of every automotive engineer’s tongue is the term “light-weighting”. This means using modern materials (aluminum, plastics, composites, and the list goes on…) to remove weight wherever possible. This reduces the mass of the vehicle, which simultaneously improves its fuel economy and improves its survivability in those crash tests. These choices also improve “Noise, Vibration, & Harshness” for the driver and passengers. What’s All This Got to do With Paint? All these different materials each offer their own challenges to the paint team. Obviously, from an appearance perspective, the plastic thermoformed bumpers and fascias must match the body color and gloss – as must the molded door handles, mirror housings, gas filler doors, etc. This means they all should be painted with the same paint…right? 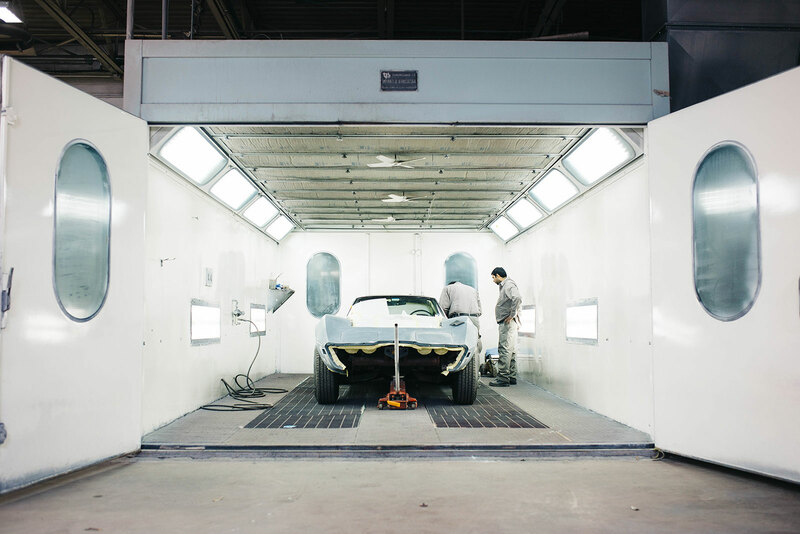 There are many considerations that go into the design of a modern automotive paint. Let’s start with curing it on the surface after application. We’re all familiar with the concept of “baking” the paint to cure it, but you clearly can’t heat the plastic parts as hot as you can the metal parts, so the paint used on the plastic parts has to cure at a lower temperature than does that used on the metal body parts. Then there’s the question of adhesion. The paint must stick to the parts you’re putting it on – and for a very long time over a wide variety of conditions. But the metal surface is very different than the plastic surface, and both react very differently to changes in temperature, humidity, etc. For instance, the metal parts are prone to expand more in the hot sun than will the plastic parts. As a result, the formulations will have to be “tweaked” accordingly. And the mention of “humidity” brings up another aspect of paint that most people don’t think about – protection. In addition to appearance, an equally important function for the coating is to protect the substrate from external factors. But different substrates are vulnerable to different things. Steel parts are very susceptible to moisture, so the paint must protect the metal parts from exposure to water. Plastic is virtually impervious to water, so this is less of a concern for the paint. On the other hand, plastic is very susceptible to damage from UV exposure, whereas steel and aluminum are unaffected, again, driving changes in paint formulation. Another factor rarely considered is that all of these diverse parts that make up the modern automobile are manufactured (and painted) by a variety of vendors in various locations – often in different states and even in different countries. These parts are painted in different climates, using an assortment of processes, by a diverse set of operators. But in the end, they all must come together in the assembly plant and match perfectly when placed next to one another on the finished product! Because they all must pass inspection by the most critical color detection instrument ever developed on this planet – my wife’s eye!